For my ally is the Force, and a powerful ally it is. Life creates it, makes it grow. Its energy surrounds us and binds us. Luminous beings are we, not this crude matter. 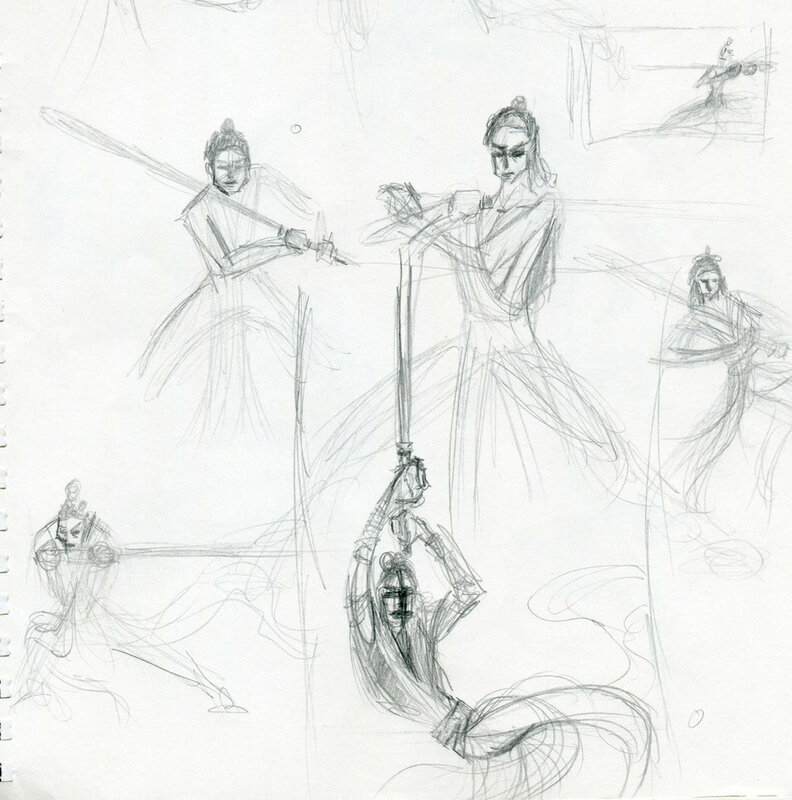 I have pages upon pages of sketches depicting scribbly, vaguely Rey-shaped lightsaber-wielding women. Swinging, chopping, posing ominously, peering through laser-shine, leaping and dodging. Twisting and lunging. Brave and potent. Unsure and hesitant. Many are quite good. Some are truly dreadful. A handful are wonderfully powerful. Those in the last category are the ones that make me feel that picking up a pencil was a worthwhile choice that morning. In the end, I chose this pose for two reasons. First was the shape of the board. No, its not an exciting or emotional reason, but there it is. After this project, I really appreciate the struggles filmmakers and DPs (director of photography or cinematographer) go through to make our movies beautiful. I’ve always got the freedom to change the shape and layout of my art if I don’t like the framing or want to change the composition. 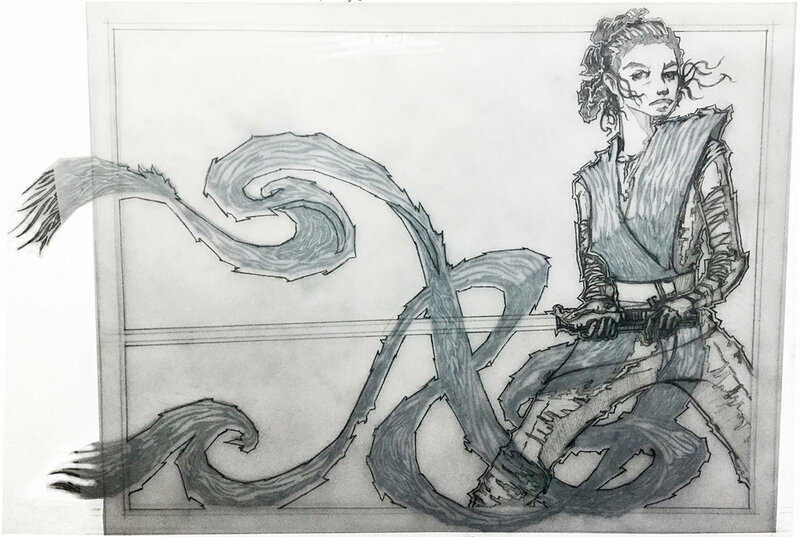 Second was Rey’s personality (in The Force Awakens… as of this writing, The Last Jedi hasn’t been released to throw any wrenches into my thought process), as well as the “personality” of the Force itself. As much as I loved the power and aggressiveness of some of the poses, those traits lend themselves more to… the Dark Side. 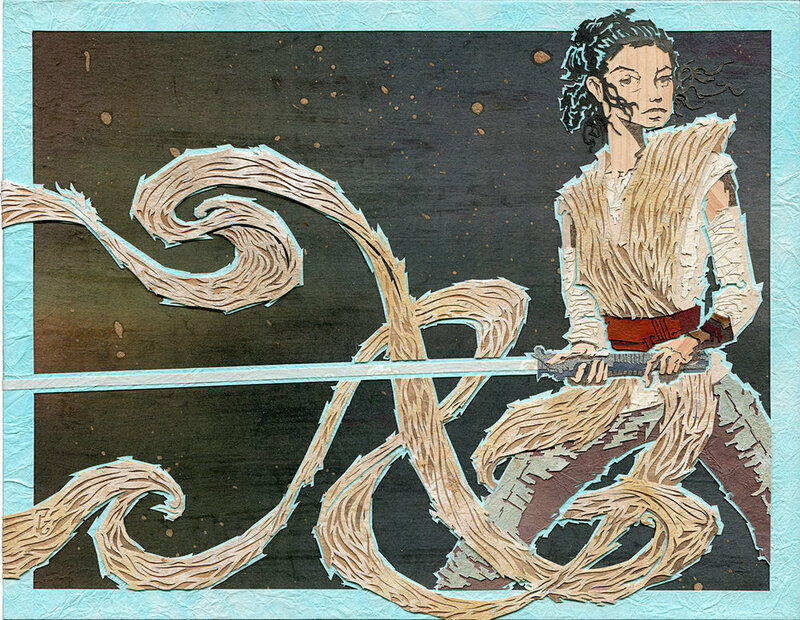 Rey is no passive wallflower, but she also doesn’t go out looking for conflict. You could say she was born into it. Where the followers of the Dark Side are only concerned with - and likely aware of - the destructive and corporeal powers, Yoda eloquently gives us a more nuanced view of this energy that connects all things. Star Wars is the first movie I saw in the theater*. My parents took us to the local drive-in on a warm night in, I’m pretty sure, 1978. There were a lot of empty spots (a weeknight? ), so we set up camp on a blanket between cars, grabbing a tinny speaker from each side to create makeshift stereo. I was 7. The movie started and, for 2 hours, those worlds and that conflict were the only things that existed. Only a kid can get so lost in a movie that it becomes more real than the real world. So, why Rey instead of Luke or Han or Leia? Good question. I think I wanted to draw a character on the brink of becoming a hero, still fresh and fairly innocent. Before the damage and heartbreak, cynicism and self-knowledge etch lines on their faces. Before loss and sacrifice take their toll. When standing against the bad guys and swinging a lightsaber still seem like all that’s needed to be a hero. That brief moment in time where everything is still potential and optimism. *Actually, there may have been another, but it was such an insignificant experience that I’ve deleted it from my memory. And this is a better story.